The advice from the largest association of franchisors in the Commonwealth of Australia, the Franchise Council of Australia (the FCA), is that you shouldn’t use an advisor who isn’t a paid subscriber to their association. That advice extends to franchise agreements bought from online retailers. This isn’t impartial advice. The trade association is comprised of experienced and knowledgeable people, but it is a private company, commercially operated to promote and to protect the financial interests of its subscribers. The Franchise Council of Australia promotes ethical franchising. We agree with this, not as a matter of philosophy but because a successful franchisor is one who helps his franchisees to create profitable businesses while he expands his own. Your franchise agreement has to form the basis of a sound and profitable deal for both sides. Franchising is regulated by specific legislation. 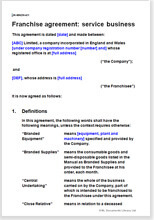 The Franchising Code of Conduct regulates parties to “franchise agreements”. The Franchising Code of Conduct is a mandatory industry code of conduct that has the force of law under the Competition and Consumer Act 2010. The purpose of the Franchising Code of Conduct is to regulate the conduct of participants in the franchise sector toward one another. According to mandatory Franchise Code of Conduct the franchisor must give franchisee copies of the Code of Conduct, Disclosure Document, Franchise Agreement (in its final format), and copies of other agreements (i.e. leases) in either electronic or hard-copy form at least 14 days before franchisee enter into agreement or pay non refundable money. A franchisee may terminate an agreement within seven days of entering into the agreement or making any payment under the agreement, whichever occurs earlier. Where this happens, the franchisor must refund all payments made by the franchisee within 14 days, minus any reasonable expenses provided for in the agreement. There is no cooling-off period for a renewal, transfer or extension of an existing franchise agreement. Where the advantage to the franchisee is from use of specialised systems (such as software or methods of working), the franchised brand, and/or centralised service provision (such as the use of a website to collect customer orders or take payment). Where the franchisor has developed intellectual property that forms a key part of the service offering. The agreement is comprehensive enough to be used by a business of any size, but we assume that the business will be small or medium sized, perhaps with several established branches already. The franchisor may be new to franchising, or may be looking to extend into the Commonwealth of Australia. The franchise territory can be of any size, from part of a town to a continent. Generally, it is more advantageous to the franchisor to keep the area small and grant licenses to operate in additional areas to the same franchisee later. This agreement can be used to grant territory outside the Commonwealth of Australia. The agreement does not cover ownership and lease of property (premises) by the franchisor. The agreement assumes that the franchisee will own or let the premises outside of this agreement either from the franchisor or someone else if required.